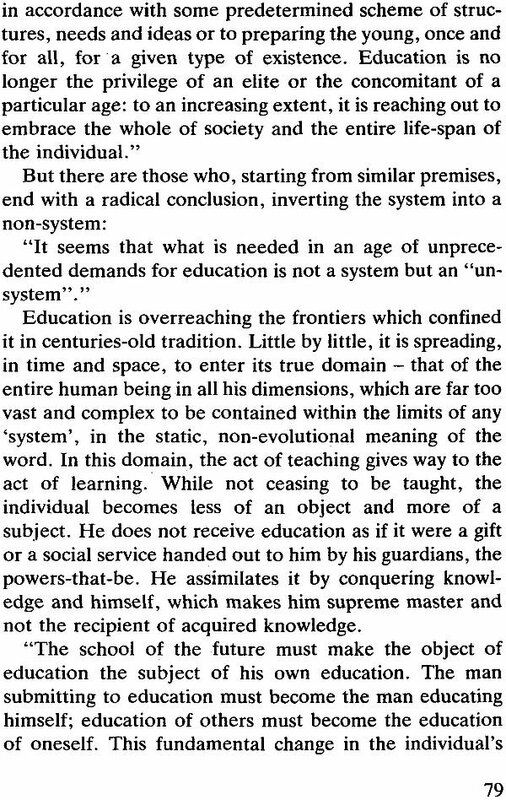 Modern prophets of Education have given many shining and revolutionary scenarios on the future of education. Often these new ideas converge towards a common theme of integrating the educational needs of the present society with the material, economic, technological, social and cultural needs of the future society. 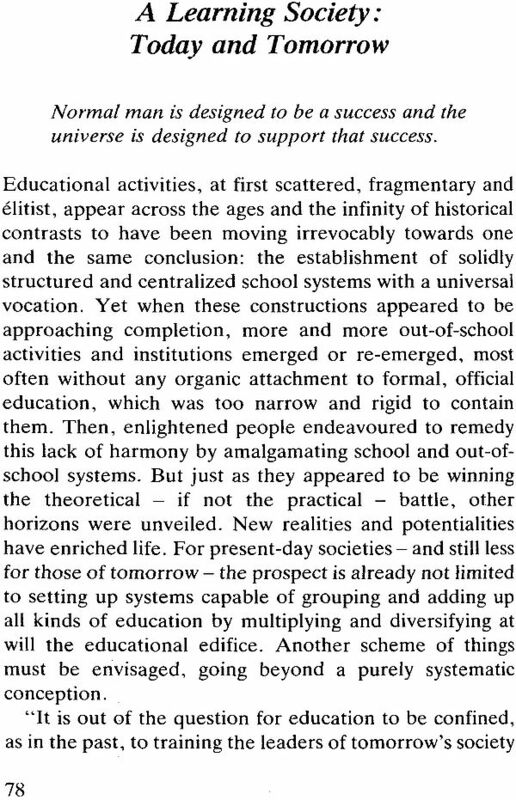 Terms like "learning society" or "deschooling society", which are popular among modern writers on education, are suggestive of the nature of the new thinking on the future of education. The line of thinking pursued by Indian spiritual thinkers has laid emphasis on a different aspect. 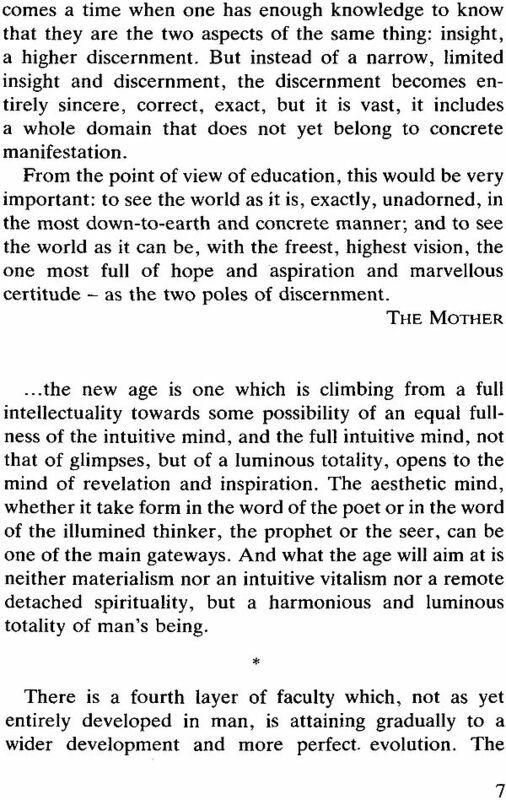 The search has not been merely for the type of education needed to cater to the material, economic, technological, social and cultural needs of the future society but much more for meeting the psychological and spiritual needs of the future Man and the type of education needed to realise his evolutionary destiny. But the question is: what is the fundamental need or aim of future education? Is it merely to create a smarter and a more well-informed, efficient, skilful, rationalised and adaptable social being revolving in a larger circle in the merry-go-round of this limited and stumbling mental consciousness or to create a new Man who goes beyond mind and reason to a higher dimension of consciousness which is free from the limitations of the mental consciousness and who can lead humanity and earth towards its evolutionary fulfilment? • Man is a transitional being and the rationalised mental consciousness is not the last summit of human evolution. Nature is preparing humanity for an evolutionary leap towards a supramental consciousness which is free from the limitations and disabilities of the mental consciousness. • This higher evolution has to be effected by a new science and technology of Consciousness or Yoga, as it is called in India. • Among all human activities, it is education based on the science of Yoga - and not economics. politics, commerce. management or material science and technology - which will play a major and prominent role in spear- heading this higher evolution of humanity. 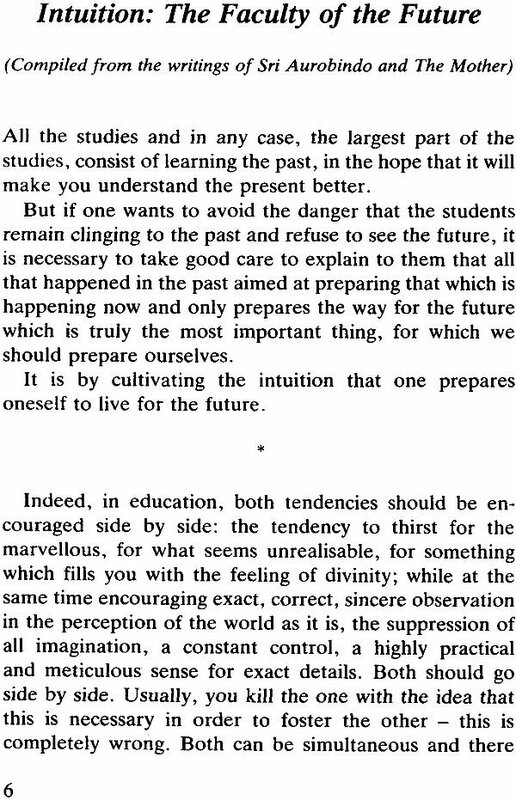 This "educational technology" of the future will emerge not from electronics, computer or information technology but from a comprehensive understanding of the levels of Consciousness and an Integral Yoga which will help man to become a fully conscious participant and collaborator in the evolutionary endeavour of Universal Nature. 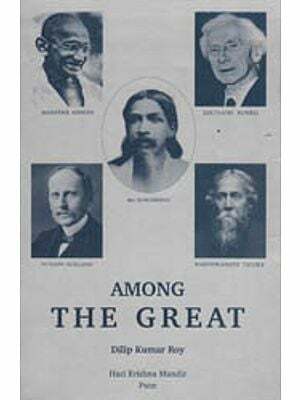 The book explores the future of education in the light of this new paradigm as it is revealed in the vision of Sri Aurobindo and the Mother. We are grateful to the authors and publishers of the articles presented in this volume. We acknowledge specially the contribution of Prof. Norman Dowsett and Prof. S. R. Jayaswal who edited the first edition which was brought out in 1974. This second edition has been greatly enlarged.